Portsmouth, New Hampshire (April 25, 2014) – Four Portsmouth High School students and their teachers are visiting Nichinan Gakuen Junior-Senior High School in Portsmouth’s Sister City of Nichinan, Japan this week as part of an ongoing mutual exchange program between the two schools. This morning, the US and Foreign Ministry of Japan released a statement resulting from the summit on April 24 between the two countries’ leaders, expressing the intent to double student exchanges between the US and Japan. The Portsmouth High School delegation now in Japan includes students: James Saxe, Brenta Abbey, Madeline Dinino and Izzy Halle; and teachers: Patrick Ganz and Kyle Harrison. "Everyone agrees that the exchange program with Nichinan is an extraordinary opportunity for the students who participate," said Portsmouth High School Principal Jeff Collins. "It can be a life-changing experience to share another culture and to be the host for international visitors. Understanding the special history Portsmouth shares with Nichinan magnifies the impact." The announcement credited both binational government programs such as Fulbright scholarships and the Japan Exchange and Teaching (JET) program as well as non-governmental (NGO) initiatives between Sister Cities. 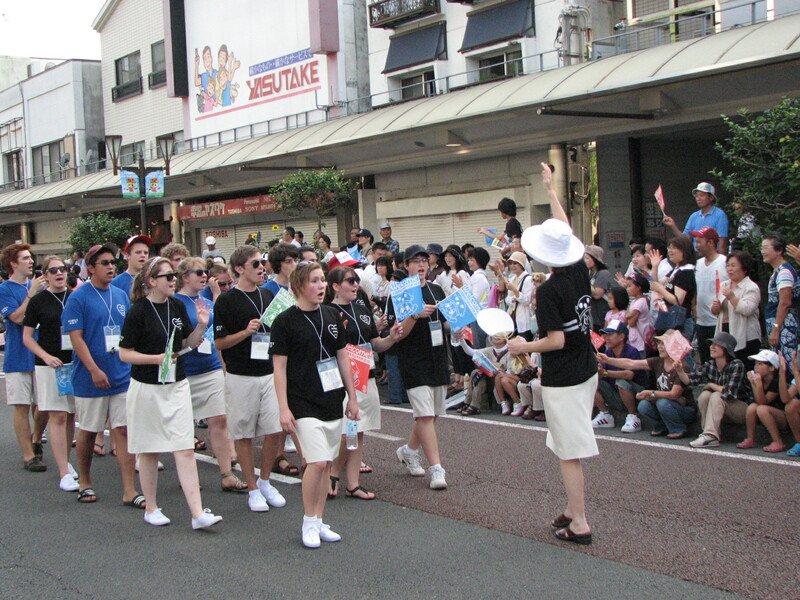 The Portsmouth exchange program with Nichinan began with Mayor Eileen Foley who invited students to visit on September 5, 1985, the 80th anniversary of the signing of the Portsmouth Peace Treaty, Nichinan is Portsmouth’s Sister City because Baron Komura, the lead Japanese diplomat who negotiated the Treaty in 1905 was born there and Portsmouth. The cherry trees planted at City Hall were funded by a gift from the City of Nichinan, also in 1985. In 2010 members of the Portsmouth High School Madrigal Singers visited Nichinan and another group traveled there last spring. Last October, 19 students from the Nichinan Gakuen Junior-Senior High School, their teacher and their superintendent visited Portsmouth High School and another group will arrive this October. In a follow-up statement the US-Japan Conference of Cultural and Education Interchange (CULCON) noted, “Broad people-to-people exchange between Japan and the United States has been a key pillar of our Alliance since its inception. Close ties and shared values between the people of the United States and the people of Japan form the foundation of the global partnership between our nations.” New Hampshire celebrates Portsmouth Peace Treaty Day every September 5th in honor of the citizen diplomacy displayed here in 1905 and today. In another parallel, the Obama-Abe statement announced that to symbolize “the grassroots friendship uniting our nations,” the U.S. government and a range of private sector partners have created the Friendship Blossoms Initiative, which is currently planting 3,000 American dogwood trees throughout Japan on behalf of the people of the United States, to reciprocate the City of Tokyo’s gift of 3,000 flowering cherry trees to Washington, DC in 1912. The 1912 gift from Japan is celebrated each year during the National Cherry Blossom Festival, an iconic spring event in Washington, D.C. When the Nichinan students visited Portsmouth in October they commemorated the planting at the High School of cherry trees descended from those Washington trees. Japan repeated its gift of trees to 32 cities across the country in 2012 for the 100th anniversary and the Japan-America Society of NH received some of those trees, in recognition of the fact that the 1912 gift was in thanks for US help in negotiating an end to the Russo-Japanese War – with the Portsmouth Peace Treaty.